A super easy to decorate cake to get everyone in the Halloween spirit. 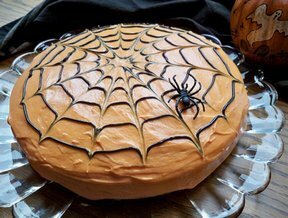 The kids will love this Spider Web Cake. Let them lend a hand in decorating. They will enjoy watching as the spider web is created and of course, they will all want to add the spider! See step-by-step how to make everyone's favorite caramel apples. They will go great at your Halloween party. Serve a cup of blood to your guests at your Halloween party and watch them squirm as they try to drink it.